Andrew Taylor-Troutman is a young pastor who loves his small congregation in Dublin, Virginia. 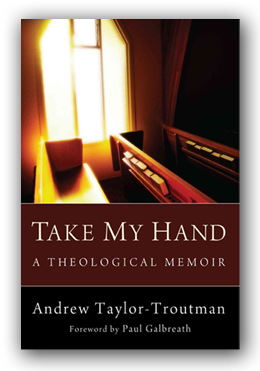 In his book, Take My Hand, he takes readers on a journey through their first year together as pastor and people. He stands with the congregation where their lives meet the word from scripture, and the living Word, Jesus. Along the way he reflects on many topics, including how faith communities can live together despite differences of opinion. Pastor and people take one another by the hand. I highly recommend this book for anyone who loves small churches, and for beginning and experienced pastors alike. You can read my full review of the book for the Presbyterian Outlook here. You can visit Andrew’s web site, read an excerpt from the book, and read his blog here. You can also hear him speak about the book at this July 31, 2012 Morton Library Book Talk at Union Presbyterian Seminary via Union Live. You can hear it live at 6:00 p.m. EDT on July 31, or you can view the archived version later. Just scroll down to Book Talks on the Union Live page.